Even less-experienced chess players have learnt how to develop their pieces in the opening or even know certain opening variations by heart. But when the middlegame starts, they don’t know how to judge positions and develop their play – and their chess stagnates. 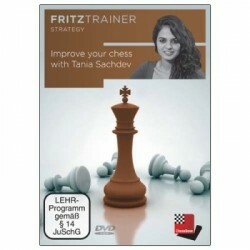 On this DVD, well-known Indian WGM Tania Sachdev shows you how to evaluate certain positions and then find the right concepts and plans on the basis of her own games. Sachdev explains her own thoughts and recounts how she arrived at successful decisions and, as a result, played good moves.